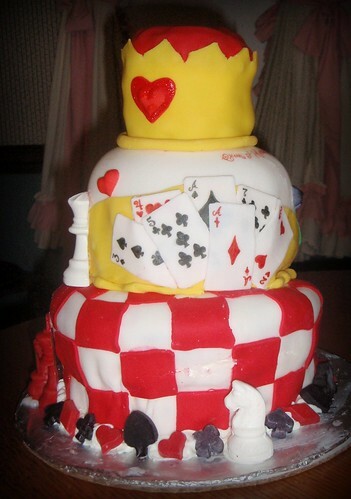 So the idea of a checkerboard cake was the whole reason I came up with the idea of an Alice in Wonderland party theme. 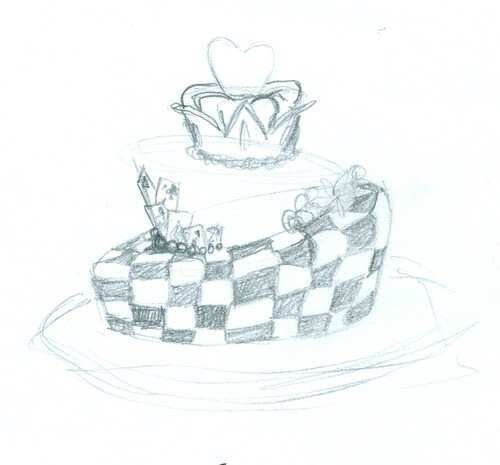 My sister took cake decorating classes a few years ago, and she gave me her checkerboard cake pan set over New Year’s. I LOVE this picture. This is when I LOVED my cake. After I dirty iced, (;-)) I covered in plastic wrap (need to get a couple cake carriers that I use transport in) and stuck it in the fridge until I was ready to cover it with fondant. 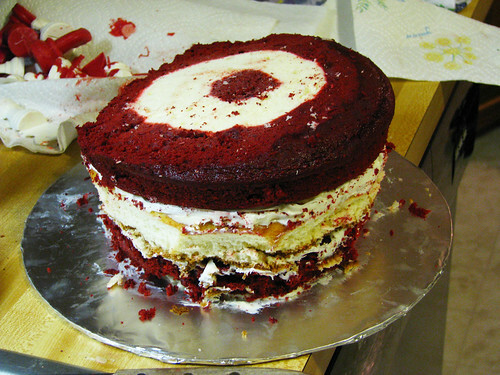 That night I also baked the layers for the second tier, and stuck ’em in the freezer. The night before the dinner, I did the layers for the top tier. Saturday dawned, and the day was spent on the cake. 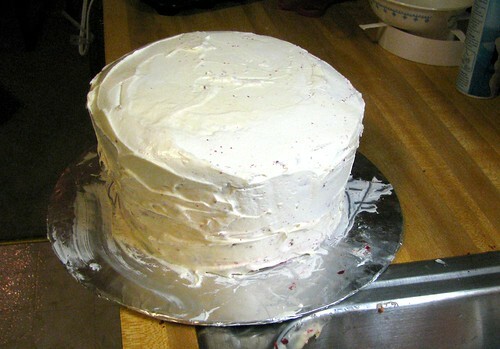 First thing was to assemble the top two tiers and dirty ice. Into the refrigerator they go. covered in too much fondant. 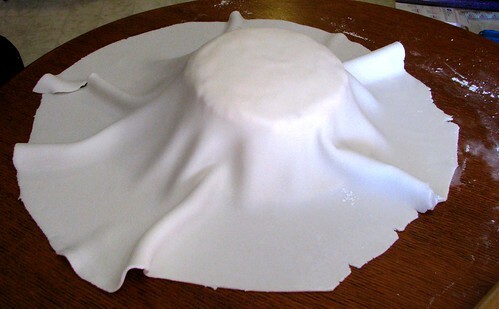 This is the part that I found most difficult, which may have been easier had the fondant been thinner. There were a couple spots of rippage and wrinkles in the fondant, but again, I wasn’t too worried at that point. We rolled the red for the base and used a cutter to make the squares and began to assemble. After that, it was just piecing everything together. The drawing of the rabbit hole on the back was to fill empty space that I had planned to fill with a few rose bushes, but the one I made didn’t look like I wanted, so I changed my mind. Ended up loving the rabbit hole though. The crown was meant to match the actual QoH crown I had for the guests, but I was running out of red fondant and had to change the design. Overall, it was a fun cake, and very educational to build. You can see the blemishes, but it just adds character, right? ;-) Not quite like the cake I pictured originally, but pretty sweet nonetheless.